Definitions of waste management on the web. Administration of activities that provide for the collection, source separation, storage, transportation, transfer, processing, treatment, and disposal of waste. A sustainable process for reducing the environmental impact of the disposal of all types of materials used by businesses. 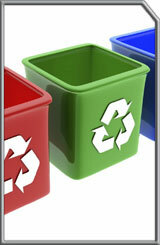 Process of managing the use and disposal of materials no longer suitable or required for their original use. The umbrella term given to all forms of handling, treating, storing, processing or disposing of waste and waste products. The waste management industry is central to delivering the necessary changes in the way we manage waste and in protecting the environment and safeguarding human health.